Contempt No.169/2016 in SWP No.2876/2016 titled Ashok Kumar Kachroo Vs J&K and Others --- Govt. Order No.50-FCS&CA of 2019 Dated:29-03-2019. Nomination of Nodal Officer for implementation of onboarding of Government to Citizen services on UMANG --- Govt. Order No.40-FCS&CA of 2019 Dated:14-03-2019. 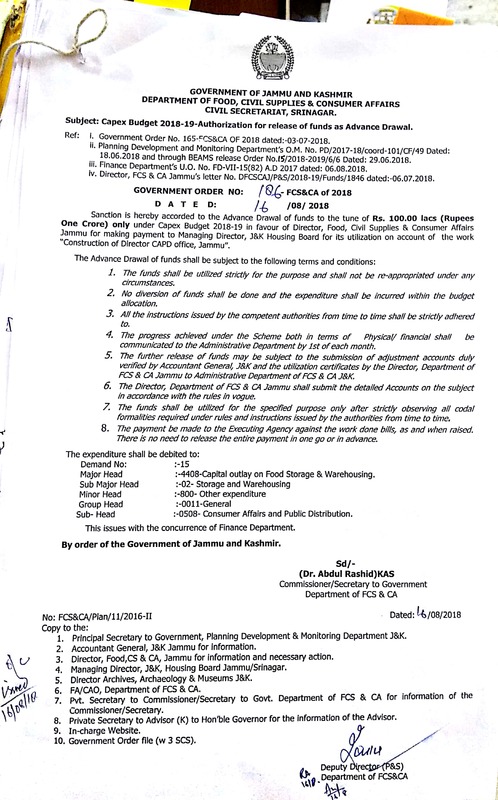 Corrigendum to Government Order No.32-FCS&CA of 2019 dated:28-02-2019. Nodal Officer for Implementation of J&K Reservation Rules --- Govt. Order No.37-FCS&CA of 2019 Dated:12-03-2019. Nomination of Nodal Officer for implementation of Direct Selling Guidelines , 2016 --- Govt. Order No.35-FCS&CA of 2019 Dated:07-03-2019. Transfers and Postings --- Govt. Order No.30-FCS&CA of 2019 Dated:27-02-2019. Transfers and Postings --- Govt. Order No.29-FCS&CA of 2019 Dated:25-02-2019. Transfers and Postings --- Govt. Order No.28-FCS&CA of 2019 Dated:25-02-2019. Transfers and Postings --- Govt. Order No.23-FCS&CA of 2019 Dated:20-02-2019. Enquiry into alleged misappropriation of 86,680 litres of SKO at Triath area of Tehsil Kalakote in District Rajouri --- Govt. Order No.21-FCS&CA of 2019 Dated:11-02-2019. Detention of Sh. Gian Chand Khajuria, TSO Udhampur in Police Station Anti Corruption Bureau in case FIR No.36/2018 P/S VOJ, Anti Corruption Bureau --- Govt. Order No.19-FCS&CA of 2019 Dated:07-02-2019. Transfer and Postings of I/C Assistant Directors of the Department of Food, Civil Supplies and Consumer Affairs --- Govt. Order No.18-FCS&CA of 2019 Dated:04-02-2019. Capex Budget 2018-19 - Authorization for release of funds as Advance Drawal --- Govt. Order No.186-FCS&CA of 2018 Dated:16-08-2018. Initiation of Regular Departmental Action against Mr. Mushtaq Ahmad Dar, the then TSO, Pulwama, Mr. Nazir Ahmad Allie the then Storekeeper Town Area Committee, Pulwama, Mr. Ajaz Ahmad Andrabi, the then Assistant Storekeeper, CA&PD, Malikpora, Pulwama- Appointment of an Inquiry Officer thereof --- Govt. Order No.164-FCS&CA of 2018 Dated:03-07-2018. Grant of 3rd In-situ promotion in favour of Sh. Tilak Raj Ex-Chowkidar, Legal Metrology, Department --- Govt. Order No.163-FCS&CA of 2018 Dated:02-07-2018. Transfer and Posting of I/C Assistant Director, Department of Food, Civil Supplies and Consumer Affairs --- Govt. Order No.162-FCS&CA of 2018 Dated:28-06-2018. Delegation of Drawing & Disbursing powers to the District Consumer Foras and opening of Bank Accounts thereof --- Govt. Order No.160-FCS&CA of 2018 Dated:26-06-2018. Rescinding of Order No.128-DFCS&CAJ of 2018 dated 19-06-2018 and Order No.129-DFCS&CAJ of 2018 dated 19-06-2018 --- Govt. Order No.158-FCS&CA of 2018 Dated:21-06-2018. Transfers and Postings --- Govt. Order No.156-FCS&CA of 2018 Dated:07-06-2018. Constitution of State Level/Divisional Level Committee for Monitoring of Revolving Funds and prior authorization for incurring expenditure by the Directorates --- Govt. Order No.154-FCS&CA of 2018 Dated:06-06-04-2018. Implementation of Aadhaar based Biometric attendance system and disposal of HCM's grievance cell complaints-Nomination of Nodal Officer --- Govt. Order No.153-FCS&CA of 2018 Dated:06-06-04-2018. Tendering for supply of sugar --- Govt. Order No.152-FCS&CA of 2018 Dated:05-06-04-2018. Tentative Combined Seniority list of the Chief Inspector(s) of the Department of Food, Civil Supplies and Consumer Affairs, as it stood on 01-01-2018 --- Govt. Order No.151-FCS&CA of 2018 Dated:04-06-04-2018. Streamlining of allocation of foodgrains under Welfare Institution and Hostels Scheme. Transfers and Postings of Junior Scale KAS Officers of Department of Food, Civil supplies and Consumer Affairs --- Govt. Order No.145-FCS&CA of 2018 Dated:27-04-2018. Issuance of Fair Price Shop License in favour of Mr. Riaz Ahmad S/o Wazir Hussain R/o Dandkote Rajouri --- Govt. Order No.144-FCS&CA of 2018 Dated:26-04-2018. Transfer of K Oil Licence of licensee Mr. Dharmander Kumar S/o Shri Sagar Chand R/o Centre Padyari Tehsil & District Kathua in favour of his wife namely Smt. Rajani Devi W/o Mr. Dharmander Kumar --- Govt. Order No.143-FCS&CA of 2018 Dated:26-04-2018. Creation of New Fair Price Shop for the location at Village Aloosa Kralpora, District Kupwara --- Govt. Order No.141-FCS&CA of 2018 Dated:25-04-2018. Opening of New Fair Price Shops in District Baramulla --- Govt. Order No.140-FCS&CA of 2018 Dated:25-04-2018. Confirmation of Mr. Ajaz-ul-Hussain, as Junior Storekeeper, Department of FCS&CA, Leh --- Govt. Order No.138-FCS&CA of 2018 Dated:24-04-2018. Creation of New Fair Price Shop for the location at Village Pahno, District Shopian --- Govt. Order No.137-FCS&CA of 2018 Dated:24-04-2018. Utilization of Services --- Govt. Order No.136-FCS&CA of 2018 Dated:24-04-2018. Creation of New Fair Price Shop for the location at Village Kamber, District Baramulla --- Govt. Order No.135-FCS&CA of 2018 Dated:24-04-2018. Nomination of Shri Sanjay Vashist, Joint Director, (P&S) Department of Food, Civil Supplies and Consumer Affairs as State Level Nodal Officer under CSS "End to End Computerization of TPDS Operations" --- Govt. Order No.134-FCS&CA of 2018 Dated:23-04-2018. Establishment of new Fair Price Shops in District Budgam --- Govt. Order No.133-FCS&CA of 2018 Dated:23-04-2018. Conversion of savings of NPHH Rice to MMSFES --- Govt. Order No.132-FCS&CA of 2018 Dated:23-04-2018. Issuance of Fair Price Shop License in favour of Shri Mohd. Hussain S/o Shri Shair Mohd R/o Suranga Tehsil Kahara District Doda --- Govt. Order No.131-FCS&CA of 2018 Dated:23-04-2018. Transfers and Postings of Jr. Scale KAS Officers/Assistant Directors/I/C Assistant Directors/Chief Inspectors --- Govt. Order No.130-FCS&CA of 2018 Dated:20-04-2018. Constitution of Committee for Financial Audit on account of Food Allocation, Distribution, Sale Proceeds and expenditure incurred out of Revolving Fund in the State --- Govt. Order No.129-FCS&CA of 2018 Dated:20-04-2018. Constitution of Technical Committee for procurement of PDS sugar from the open market for the year 2018-19 --- Govt. Order No.128-FCS&CA of 2018 Dated:20-04-2018. Issuance of New Fair Price Shop in favour of Syed Mohammad Syed Shah S/o Syed Abdul Rehman Shah R/o Saliya Panchalpora, Kamnevan District Anantnag --- Govt. Order No.127-FCS&CA of 2018 Dated:19-04-2018. Initiation of RDA against Shri Syed Ahmad then Assistant Director CAPD, Doda Sh. Om Parkash, the then TSO, Sh. Pankaj Thakur the then TSO and Sh. Tariq Hussain the then TSO Thathri Doda - Appointment of an Inquiry officer --- Govt. Order No.126-FCS&CA of 2018 Dated:19-04-2018. Transfers and Postings of Tehsil Supply Officers of Department of Food, Civil Supplies and Consumer Affairs, Kashmir --- Govt. Order No.125-FCS&CA of 2018 Dated:19-04-2018. Issuance of Fair Price Shop License in favour of Mr. Abdul Qayoom Mir S/o late Abdullah Mir R/o Mohra Bharote Tehsil Budhal District Rajouri --- Govt. Order No.124-FCS&CA of 2018 Dated:19-04-2018. Issuance of Fair Price Shop License in favour of Mr. Sameer Ahmad Najar S/o Ghulam Rasool Najar R/o Nowgam Shahbad Bala District Anantnag --- Govt. Order No.123-FCS&CA of 2018 Dated:19-04-2018. Regularization of Consolidated Drivers working in the Legal Metrology Department --- Govt. Order No.122-FCS&CA of 2018 Dated:18-04-2018. Issuance of Fair Price Shop License in District Anantnag --- Govt. Order No.121-FCS&CA of 2018 Dated:18-04-2018. Commencement of next batch of "Basic training Course (Eng. & Hindi med.) from 2nd April, 2018 to 31st July, 2018-deputation of officials thereof --- Govt. Order No.120-FCS&CA of 2018 Dated:18-04-2018. Change of proprietorship of SKO Wholesale license bearing No.KTH/AD/90-91 stands issued in favour of M/s Kathua Service Station, Village Maha Tehsil and District Kathua --- Govt. Order No.119-FCS&CA of 2018 Dated:18-04-2018. Transfer and posting --- Govt. Order No.118-FCS&CA of 2018 Dated:17-04-2018. Issuance of fresh Retail Kerosene Oil License in favour of Mtr. Gulnaz Begum W/o Shri Abdul Aziz R/o Tarala Tehsil Kotranka, District Rajouri in relaxation in qualification bar --- Govt. Order No.117-FCS&CA of 2018 Dated:17-04-2018. Engagement of Malik Nasrullah (Ex-Assistant Director), as Officer Incharge Toll Free Call Centre-extension thereof --- Govt. Order No.116-FCS&CA of 2018 Dated:17-04-2018. Regular Engagement of Casual and Other Workers (CSLWs) - Constitution of Departmental Committee (s) thereof --- Govt. Order No.115-FCS&CA of 2018 Dated:16-04-2018. Release of Charge allowance in favour of Incharge Assistant Directors of Department of Food, Civil Supplies and Consumer Affairs --- Govt. Order No.114-FCS&CA of 2018 Dated:12-04-2018. Nomination of Shri Mohammad Iqbal Zargar, Deputy Director (P&S), Directorate of FCS&CA Jammu as Nodal Officer for J&K State for Implementation of Khadhya Abanton (CALLOC) --- Govt. Order No.111-FCS&CA of 2018 Dated:12-04-2018. Creation of New Fair Price Shop for the location at Village Nanil B, District Anantnag --- Govt. Order No.110-FCS&CA of 2018 Dated:11-04-2018. Creation of New Fair Price Shop for the location at Kacherpora, District Budgam --- Govt. Order No.109-FCS&CA of 2018 Dated:11-04-2018. Delegation of DDO Powers --- Govt. Order No.108-FCS&CA of 2018 Dated:09-04-2018. Transfer of dealership license of Shri Javaid Iqbal S/o Wali Mohd. Zargar in the name to his cousin brother namely Shri Ashiq Hussain R/o Neeli Halore District Doda --- Govt. Order No.107-FCS&CA of 2018 Dated:06-04-2018. Creation of New location for opening of Fair Price shop --- Govt. Order No.106-FCS&CA of 2018 Dated:06-04-2018. Creation of New Fair Price Shop for the location at Village Nandpora Khahabal, District Anantnag --- Govt. Order No.105-FCS&CA of 2018 Dated:06-04-2018. Providing of Transport by the J&KSRTC for carriage of foodgrains in respect of Jammu Division --- Govt. Order No.104-FCS&CA of 2018 Dated:05-04-2018. Transfer of Fair Price Shop dealership license of Smt. Maheera Majid D/o Shri Abdul Majid Bhat R/o Khanawari Mattan Tehsil and District Anantnag to his sister-in-law Smt. Rukhsana Mehraj W/o Mehraj-ud-din Bhat R/o Pranabawan Mattan District Anantnag --- Govt. Order No.103-FCS&CA of 2018 Dated:05-04-2018. Creation of New Fair Price Shop for the location at Village Sogam, District Budgam --- Govt. Order No.102-FCS&CA of 2018 Dated:05-04-2018. Creation of New Fair Price Shop for the location at Dangerpora Uranhail, District Anantnag --- Govt. Order No.101-FCS&CA of 2018 Dated:05-04-2018. Issuance of Fair Price Shop License in favour of Mr. Mohammad Irfan Wani D/o Nisar Ahmad Wani R/o T.A Shah Bapora, District Bandipora --- Govt. Order No.100-FCS&CA of 2018 Dated:05-04-2018. Deputation of Smt. Meenakshi Suman, Assistant Storekeeper, Department of Food, Civil Supplies and Consumer Affairs, Kashmir to Director of Food, Civil Supplies and Consumer Affairs Jammu --- Govt. Order No.99-FCS&CA of 2018 Dated:03-04-2018. Issuance of Fair Price Shop License in favour of Mr. Menaz Kosser D/o Nasar Hussain R/o Tarkassi District Rajouri for the location at Ratta Jabbar --- Govt. Order No.98-FCS&CA of 2018 Dated:03-04-2018. Delegation of DDO Powers --- Govt. Order No.97-FCS&CA of 2018 Dated:28-03-2018. Establishment of new fair Price Shops in District Kathua --- Govt. Order No.96-FCS&CA of 2018 Dated:28-03-2018. Creation of new fair Price Shops in District Baramulla --- Govt. Order No.95-FCS&CA of 2018 Dated:28-03-2018. Transfers and Postings of Inspectors, Legal Metrology Department--- Govt. Order No.94-FCS&CA of 2018 Dated:28-03-2018. Hiring of Transport for carriage of foodgrains of FCS&CA Department from open market for the year 2016-17 & 2017-18 --- Govt. Order No.89-FCS&CA of 2018 Dated:27-03-2018. Transfers and Postings of Assistant Controllers, Legal Metrology Department--- Govt. Order No.86-FCS&CA of 2018 Dated:26-03-2018. Transfer of K.Oil dealership license in favour of Mr. Manzoor Ahmad Sofi S/o Mohammad Ramzan Sofi (deceased licensee) R/o Kadlabal Pampore District Pulwama --- Govt. Order No.84-FCS&CA of 2018 Dated:23-03-2018. Capex Budget 2017-18 - Authorization for release of funds --- Govt. Order No.83-FCS&CA of 2018 Dated:23-03-2018. Capex Budget 2017-18 - Authorization for release of funds --- Govt. Order No.82-FCS&CA of 2018 Dated:22-03-2018. Proposal for re-organization of Legal Metrology Department-Constitution of a Committee thereof --- Govt. Order No.81-FCS&CA of 2018 Dated:20-03-2018. Release of funds for the Financial year 2017-18 under "Strengthening of Consumer Foras" --- Govt. Order No.80-FCS&CA of 2018 Dated:16-03-2018. Corrigendum to Govt. Order No.56-FCS&CA of 2018 Dated:23-02-2018. Release of funds for the year 2017-18 --- Govt. Order No.79-FCS&CA of 2018 Dated:16-03-2018. Re-instatement of Mr. Ranjit Singh i/C Assistant Director, Department of Food, Civil Supplies and Consumer Affairs --- Govt. Order No.78-FCS&CA of 2018 Dated:14-03-2018. NOTICE:-Judgment dated: 24-11-2017 passed in SWP Nos. 3152/2015 and 1347/2016 entitled "Rajesh Heera & Ors V/s State of J&K & Ors" and LPA No.233/2017 titled Ajay Kumar & Ors V/s State of J&K & Ors. The Jammu and Kashmir Brick Kilns (Regulation) Act, 2010 (Act No. XVII of 2010)- Power of inspection thereof --- Govt. Order No.75-FCS&CA of 2018 Dated:13-03-2018. Extension in the period of deployment of Mr. Mohammad Yousuf Bhat, Rewinder (Class-IV) JKI Limited to the Department of FCS&CA, Kashmir --- Govt. Order No.74-FCS&CA of 2018 Dated:13-03-2018. Issuance of Fair Price Shop License in favour of Mr. Tariq Ahmad Mir S/o Bashir Ahmad Mir R/o Cheki Ashmuji Tehsil & District Kulgam --- Govt. Order No.73-FCS&CA of 2018 Dated:13-03-2018. Issuance of Fair Price Shop License in favour of Mr. Zahid Jahangeer S/o Sh. Mir Jahangeer Ahmad R/o Talab-e-Kalan Char-i-Sharief District Budam --- Govt. Order No.72-FCS&CA of 2018 Dated:13-03-2018. Issuance of Fair Price Shop License in favour of Mr. Muzaffar Ahmad Bhat S/o Sh. Mohd Abdullah Bhat R/o Hugam District Anantnag --- Govt. Order No.71-FCS&CA of 2018 Dated:12-03-2018. Opening of Fair Price Shops under Public Distribution System --- Govt. Order No.70-FCS&CA of 2018 Dated:12-03-2018. Transfer and Posting --- Govt. Order No.69-FCS&CA of 2018 Dated:12-03-2018. Transfer of Fair Price Shop License in favour of Mr. Amit Gupta S/o Sh. Shakti Kumar Gupta R/o H.No.631, Digiana Jammu --- Govt. Order No.68-FCS&CA of 2018 Dated:09-03-2018. Issuance of Fair Price Shop License in favour of Sh. Mangat Ram S/o Jagan Nath R/o Sair Tehsil Kalakote Rajouri --- Govt. Order No.67-FCS&CA of 2018 Dated:08-03-2018. Issuance of Fair Price Shop License in favour of Sh. Showkat Nabi Peer S/o Ghulam Nabi Peer R/o Anderhama, Muqam-i-Shahwali District Kupwara --- Govt. Order No.66-FCS&CA of 2018 Dated:08-03-2018. Mis-conduct Sh. Ranjit Singh, Chief Inspector-suspension thereof --- Govt. Order No.65-FCS&CA of 2018 Dated:08-03-2018. Issuance of Fair Price Shop License in favour of Sh. Arvind Kumar S/o Raj Kumar R/o Drafra Tehsil Bhalla District Doda --- Govt. Order No.64-FCS&CA of 2018 Dated:08-03-2018. Transfer and Posting --- Govt. Order No.63-FCS&CA of 2018 Dated:07-03-2018. Transfer and Posting --- Govt. Order No.62-FCS&CA of 2018 Dated:03-03-2018. Issuance of Fair Price Shop License in favour of Sh. Himat Singh S/o Gokul Chand R/o Ungai Paddar District Kishtwar --- Govt. Order No.61-FCS&CA of 2018 Dated:03-03-2018. Transfer and Postings of the Junior Scale KAS Officers --- Govt. Order No.60-FCS&CA of 2018 Dated:03-03-2018. Transfer of K.Oil license in favour of Shri Rajinder Singh S/o late Shri Kartar Singh R/o Chanderkote District Ramban --- Govt. Order No.59-FCS&CA of 2018 Dated:02-03-2018. Release of funds for the year 2017-18 --- Govt. Order No.57-FCS&CA of 2018 Dated:23-02-2018. Release of funds for the year 2017-18 --- Govt. Order No.56-FCS&CA of 2018 Dated:23-02-2018. Constitution of Committee for Review of NFSA and MMSFES Schemes --- Govt. Order No.54-FCS&CA of 2018 Dated:21-02-2018. Extension of the validity of ration cards for the year 2018-19 --- Govt. Order No.46-FCS&CA of 2018 Dated:20-02-2018. Finalization of suitable rates for grinding of Wheat --- Govt. Order No.43-FCS&CA of 2018 Dated:12-02-2018. Transfers and Postings of Assistant Directors/I/c Assistant Directors of Department of Food, Civil Supplies and Consumer Affairs --- Govt. Order No.42-FCS&CA of 2018 Dated:12-02-2018. Circular No.03-FCS&CA of 2018 Dated:09-02-2018. Appointment of Nodal Officer in Srinagar District for operationalization of PoS devices --- Govt. Order No.41-FCS&CA of 2018 Dated:09-02-2018. Inclusion of BPL beneficiaries in PHH category --- Govt. Order No.40-FCS&CA of 2018 Dated:08-02-2018. Supply of Trucks for Transportation of Goods/Foodgrians of FCS&CA Department for the year 2016-17 & 2017-18 -Cancellation of Tenders thereof --- Govt. Order No.39-FCS&CA of 2018 Dated:08-02-2018. Corrigendum to Govt. Order No.32-FCS&CA of 2018 Dated:23-01-2018. Transfer of ration Dealership License of Late Mohd. Ashraf in the name of his son namely Shri Jabar Ahmed S/o late Mohd. Ashraf R/o Mastandara District Poonch on commission basis --- Govt. Order No.33-FCS&CA of 2018 Dated:02-02-2018. Medical Re-imbursement claim in favour of Nissar Ahmad (Watchman) --- Govt. Order No.32-FCS&CA of 2018 Dated:02-02-2018. WP(Civil) No.857/2015-Swaraj Abhiyan v/s UOI & Ors -reg. Composition of Vigilance Committees under National Food Security Act, 2013 --- Govt. Order No.31-FCS&CA of 2018 Dated:29-01-2018. Deputation of Mr. Rajesh Gupta, Senior Assistant, Department of Food, Civil Supplies and Consumer Affairs, Jammu --- Govt. Order No.29-FCS&CA of 2018 Dated:25-01-2018. Revision of Sale Rates of Wheat Bran-settlement of claims of Mill Owners in respect of grinding charges thereof --- Govt. Order No.24-FCS&CA of 2018 Dated:23-01-2018. Draft of J&K Food Security Rules, 2018 for seeking the Comments/Views of Public at large. Constitution of Technical Committee --- Govt. Order No.23-FCS&CA of 2018 Dated:20-01-2018. Constitution of State Level Purchase Committee --- Govt. Order No.22-FCS&CA of 2018 Dated:20-01-2018. Constitution of Committee for fixation of allocation of foodgrains under TPDS in J&K State --- Govt. Order No.18-FCS&CA of 2018 Dated:19-01-2018. Cancellation of Tendering process for grinding of Wheat into whole meal Atta for the year 2017-18 --- Govt. Order No.17-FCS&CA of 2018 Dated:18-01-2018. Printing of Ration Cards in favour of West PoK refugees --- Govt. Order No.15-FCS&CA of 2018 Dated:18-01-2018. Transfers and Postings of I/c Assistant Directors of Department of Food, Civil Supplies and Consumer Affairs --- Govt. Order No.13-FCS&CA of 2018 Dated:17-01-2018. Distribution of Subsidized Kerosene (SKO) in the State of Jammu and Kashmir-Constitution of a committee thereof --- Govt. Order No.12-FCS&CA of 2018 Dated:16-01-2018. Circular No.01-FCS&CA of 2018 Dated:17-01-2018. End to End Computerization of TPDS Operations (e-PDS) --- Govt. Order No.11-FCS&CA of 2018 Dated:15-01-2018. Identification of Nomadic population --- Govt. Order No.10-FCS&CA of 2018 Dated:15-01-2018. Constitution of District Level Task Force for Implementation of Supply Chain Management (SCM) under e-PDS Project --- Govt. Order No.08-FCS&CA of 2018 Dated:11-01-2018. Constitution of State Level Committee --- Govt. Order No.06-FCS&CA of 2018 Dated:10-01-2018. Constitution of a Committee to reconcile the cost of the Ration Cards --- Govt. Order No.05-FCS&CA of 2018 Dated:10-01-2018. Addendum to Government Order No.08-FCS&CA of 2017 Dated:19-01-2017. Enhancement of maximum slab of 35 kgs under Mufti Mohammad Sayeed Food Entitlement Scheme to 50 kgs per month --- Govt. Order No.414-FCS&CA of 2017 Dated:18-12-2017. Details of Institutions/Hostels under Welfare Institution Scheme J&K. Capex Budget 2017-18 - Authorization for release of funds --- Govt. Order No.412-FCS&CA of 2017 Dated:15-12-2017. Addendum: Enhancement of maximum slab of 35 Kgs under Mufti Mohammad Sayeed Food Entitlement Scheme to 50 Kgs per month --- Govt. Order No.396-FCS&CA of 2017 Dated:09-11-2017 issued under endorsement No.CAPD/Food/21/2009 dated:13-12-2017. Appointment of Ms. Navnidhi Sambyal D/o Shri Abinash Singh R/o Mandi Kehli P.O Tehsil and District Samba as Junior Assistant in the Department of Food, Civil Supplies and Consumer Affairs, Jammu (Divisional Cadre Jmmau) --- Govt. Order No.399-FCS&CA of 2017 Dated:16-11-2017. Capex Budget 2017-18 - Authorization for release of funds --- Govt. Order No.398-FCS&CA of 2017 Dated:09-11-2017. Capex Budget 2017-18 - Authorization for release of funds --- Govt. Order No.397-FCS&CA of 2017 Dated:09-11-2017. Enhancement of maximum slab of 35 Kgs under Mufti Mohammad Sayeed Food Entitlement Scheme to 50 Kgs per month --- Govt. Order No.396-FCS&CA of 2017 Dated:09-11-2017. Compassionate appointment case of Mr. Mohd Jameel S/o late Kabir Din (Ex-Weighman) R/o Village Chakrara, Tehsil Mandi, District Poonch, under SRO-43 of 1994 --- Govt. Order No.395-FCS&CA of 2017 Dated:07-11-2017. Transfers and Postings of I/c Assistant Directors/Chief Inspector of Department of Food, Civil Supplies and Consumer Affairs --- Govt. Order No.385-FCS&CA of 2017 Dated:11-10-2017. Disposal of Grievances/Complaints of the bonafide beneficiaries-stopping of salary of the Assistant Directors, FCS&CA (North and South), Srinagar --- Govt. Order No.384-FCS&CA of 2017 Dated:10-10-2017. Delegation of Drawing and Disbursing powers in favour of Assistant Director, Srinagar City North, Srinagar City South & Trade & Stores, Kashmir --- Govt. Order No.382-FCS&CA of 2017 Dated:09-10-2017. Appointment of an Inquiry Officer --- Govt. Order No.378-FCS&CA of 2017 Dated:05-10-2017. Appointment of an Inquiry Officer --- Govt. Order No.377-FCS&CA of 2017 Dated:05-10-2017. Appointment of an Inquiry Officer --- Govt. Order No.376-FCS&CA of 2017 Dated:05-10-2017. Initiation of RDA against Shri Romesh Chander Bhagat then posted as Assistant Director, FCS&CA, Kathua, Shri Akbar Ali Malik then posted as Assistant Director, FCS&CA, Kathua, Shri Baldev Raj then TSO Kathua, Shri Nek Ram then posted as Storekeeper with TSO Kathua and Shri Rajeewan Singh then posted as Storekeeper with TSO Kathua --- Govt. Order No.372-FCS&CA of 2017 Dated:27-09-2017. Appointment of an Inquiry Officer --- Govt. Order No.358-FCS&CA of 2017 Dated:04-09-2017. Sanction for Advance Drawal for Treasury --- Govt. Order No.355-FCS&CA of 2017 Dated:25-08-2017. Notice - Select list of Manual Assistant Grade-II in Legal Metrology Department vide No.LM/C-Estt/34/2016 dated:21-04-2017. Corrigendum:- Request for Proposal (RFP) for selection of system Integrator for supply installation with application and maintenance of PoS Devices -- Corrigendum to e-Tender No.03-FCS&CA/2017 dated:02-03-2017 thereof. Capex Budget 2016-17 - Authorization for release of funds --- Govt. Order No.53-FCS&CA of 2017 Dated:16-03-2017. Capex Budget 2016-17 - Authorization for release of funds --- Govt. Order No.52-FCS&CA of 2017 Dated:16-03-2017. Appointment of a Senior Officer as Focal Point coordinating procurement of pulses and stabilization of their prices --- Govt. Order No.49-FCS&CA of 2017 Dated:09-03-2017. Policy for Distribution of foodgrains/Sugar/K.Oil to Nomadic Population (Gujjar & Bakerwals) --- Govt. Order No.47-FCS&CA of 2017 Dated:08-03-2017. Accord of sanction to the prosecution of in-service accused public servant, namely: (1) Mr. Rakesh Kumar Pargal the then Supervisor CA&PD Store Udhampur (2) Mr. Kuldeep Kumar, the then Storekeeper CA&PD Store Reasi (3) Mr. Madan Lal the then Storekeeper CA&PD Store Arnas, Reasi (4) Mr. Shabir Ahmed Magray, the then TSO CA&PD Arnas & Dharmari (5) Mr. Achpal Singh the then Storekeeper CA&PD Store Dharmari (6) Mr.Mohammad Yaqoob the then Storekeeper CA&PD Store Mahore (7) Mr. Parveen Singh the then Storekeeper CA&PD Store Sarbbagga (8) Mr. Ghulam Mohi-Ud-Din the then Storekeeper CA&PD Store Chassana for commission the offences punishable U/S 5(1) (c)(d) r/w 5(2) of the Jammu and Kashmir Prevention of Corruption Act, Smvat 2006 and section 109,409,468,471 & 120-B of RPC in case FIR No.06/2009 P/S VOJ --- Govt. Order No.46-FCS&CA of 2017 Dated:07-03-2017. Notice - Select list of Manual Assistant Grade-II in Legal Metrology Department vide No.LM/C-Estt/34/2016 dated:02-03-2017. Sanction for Advance Drawal of Rs.3.80 lacs --- Govt. Order No.44-FCS&CA of 2017 Dated:02-03-2017. Interview Notice for the engagement as Consultant and Data Entry Operator. Corrigendum to Circular No.02-FCS&CA of 2017 Dated:12-01-2017 Service charges by Hotels and Restaurants - clarification thereof. Notification:-Issuance of notification of Retirement on superannuation of Officer. Implementation of Mufti Mohammad Food Entitlement Scheme in J&K vide No.CAPD/Food/21/2009(Part) Dated:22-09-2016. Implementation of Mufti Mohammad Sayeed Food Entitlement Scheme --- Govt. Order No.116-CAPD of 2016 Dated:01-07-2016. Minutes of Meeting of apex Committee under Centrally Sponsored Scheme (CSS) "End to End Computerization of TPDS Operations"
To State Informatics Officer (NIC) regarding Shifting of card types in the software. Tentative Combined Seniority/Gradation List of Chief Inspector's in the Pay Scale of Rs.9300-34800 (Grade Pay Rs.4280) as it stood on 01-01-2016 --- Govt. Order No.10-CAPD of 2016 Dated:28-01-2016.